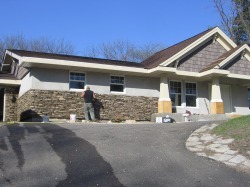 Custom Stone Installers is a family owned business providing exceptional masonry and landscape stone work for new construction and remodeling projects of all sizes. We offer the very best customer service and superior craftsmanship. Our customers wouldn't have it any other way. We offer competitive rates, reliability and on time delivery. Some of our recent interior projects include fireplaces, flooring, showers, columns, wine cellars, kitchen accents and archways. 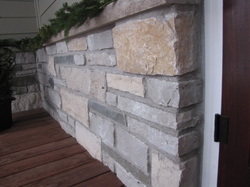 Exterior projects range from commercial to residential; entire home exterior of stone to entryways and wainscot accent. Also, landscape detail such as walkways, custom firepits and retaining walls. Call for a free estimate. Thank you for considering us for your next project. Builders appreciate Chris' experience building homes and knowledge of the entire construction process. The first phase of any stone project is to determine the design and scope of the project and when the installation fits best in the entire project flow. Some of our projects are a simple fireplace or back splash, columns or stone entry ways to an entire stone exterior, stone patio and bar area or tile flooring. What is important to us is that our customers are happy with the design and how the stone is incorporated into the overall look and feel of the home. 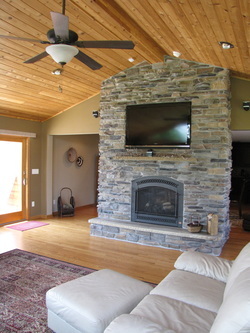 Stone adds a warmth to a room, an artistic focal point inside or a bold exterior increasing the value of your home. Fireplace inserts, cabinetry, mantles before we stone. 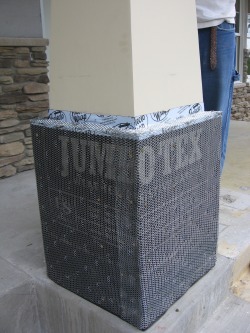 It's ideal to have a fireplace insert and the fully finished and sealed mantle installed before the stone goes in. 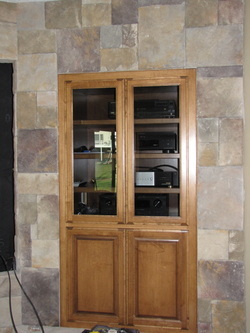 It's important we know the style and preferably have the fireplace insert faceplate onsite when installing the stone. Flooring should be held off until the project is done if at all possible. 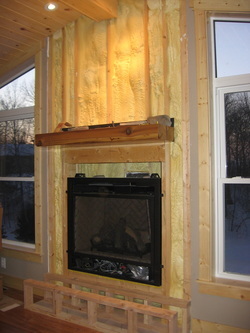 We'll frame and customize the hearth if that's an element of the project. 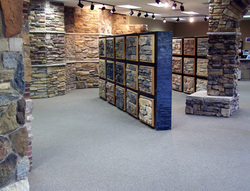 You'll want to choose your stone based on the look you want and what works best for the project. We can help. Ask your supplier how long of a lead time there is for the options you have. Sometimes that will guide your choice. There are many styles such as fieldstone, ledgestone, drystack and limestone and then many color and style choices within those styles. There is natural stone that is quarried and manufactured concrete cast stone that looks much like natural stone. We suggest you visit one of the area's showrooms to take a look at what appeals to you most or ask us for catalogues of stone suppliers to choose from if you are not able to visit a showroom. If you know the general style and look you want, we can provide samples to choose from as well. Your best bet is to take a look at local showrooms. 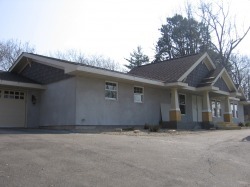 We can help you source materials and suggest Steiger ACE in Bessemer, MI. 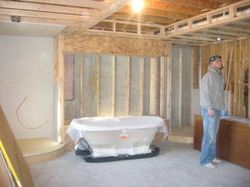 Area will be prepped with plywood or sheathing. 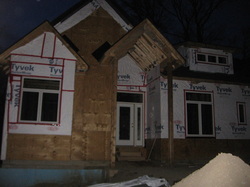 Ideally for exterior jobs the area that will have stone is prepped with plywood. Interior projects, we'll consult and see what the best surface is whether durarock or plywood. Provided the surface is prepped with proper backing in place (plywood is ideal), we put up the vapor barrier, lathe and have the lathe inspection done if required. Once the lathe is up, we are ready to prep the surface with scratch coat. Note if siding is being installed along with stone on the exterior it's important to have Chris talk with siders (if not us) so that they terminate the siding so that stone can be installed up to it. Once the lathe inspection is complete, we apply the scratch coat. We'll typically let the scratch coat dry for 24 hours or until dry before applying the stone. Chris is a perfectionist and you'll find his eye for color, style, shapes and detail to attention is second to none. Chris handpicks every stone as he applies his craftsmanship to your project. Things we've been admired for is all credited to our attention to detail. We constantly hear people rave about the fact that Chris is an artist and does such a wonderful job at creating a piece of art where the color, style and dimension of the stones flow beautifully. On a more practical level, our grout joints are even and tightly spaced unless requested otherwise. Our stone is clean and neat as is our workspace. We work fast and efficient and offer nothing but proffessionalism on the job. We typically lay the stone top down so to keep the stones as neat and clean as they can be. We see a lot of stonework around the area and it's surprising the difference there is out there depending on the masonry team laying the stone. Stone work is an art. Once the stone is applied, provided it's not drystack stone, the tuckpointing begins. As a husband and wife team, Anne and Chris both do the tuckpointing. This takes time, attention to detail to get the joints as even and smooth as possible giving the stone the timeless and finished look. This also weatherproofs the project if an exterior job. There are many different looks for tuckpointing and the standard being 1/2" grout joint. Stone adds beauty, richness and value to your property. Your home is an investment and we view every project as if it were our own home. 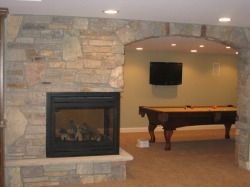 Thank you for considering Custom Stone Installers for your next project.